You’ll love the intricate design of the Baxter Bed. 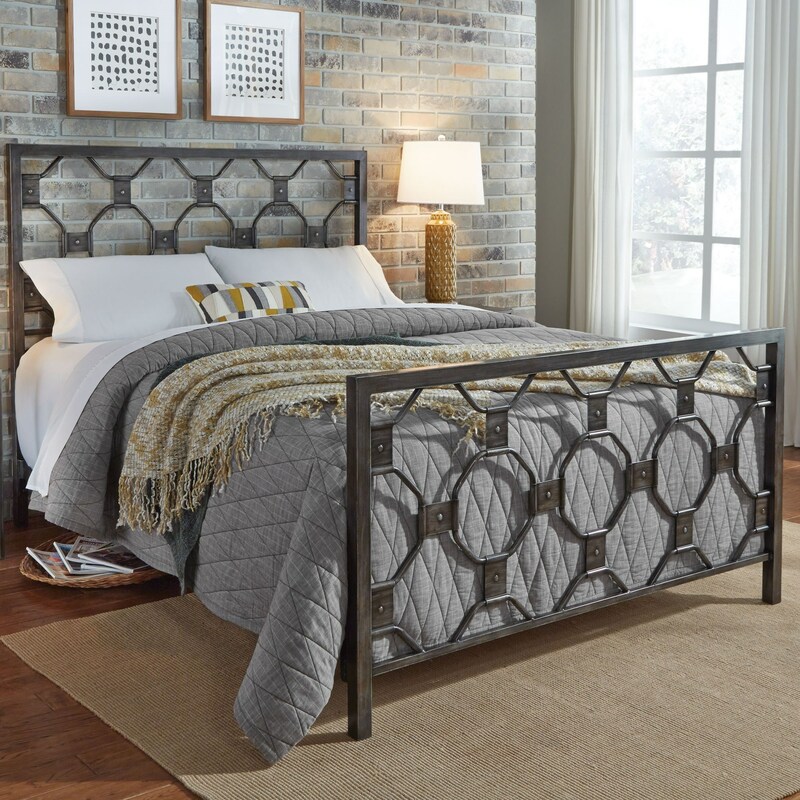 Constructed of carbon steel for strong support and long life, the headboard and footboard feature a geometric octagonal pattern framed by sturdy side and top rails. This intriguing bedroom addition is finished in a rich Heritage Silver that pairs well with any décor. The engineered bed frame consists of iron rails, cross arms and feet to provide full body support. A good ornamental (or fashionable) bed will fuse with the surrounding décor, accent your other bedroom furniture and transform a room from ordinary into something interesting and sophisticated. The Baxter will do all this plus provide a calming retreat area you’ll want to utilize for more than just sleeping. This unit includes a headboard panel, footboard panel, bed frame, instructions, and hardware bag with everything needed for bed assembly. The Baxter Complete Bed comes with a 10-year limited warranty against manufacturing defects. The Baxter Queen Baxter Complete Metal Bed with Geometric Octagonal Design by Fashion Bed Group at Al-Mart Furniture in the Oak Park, River Forest, Chicago, Elmwood Park, Forest Park, River Grove, Maywood, Melrose Park, Berwyn, Cicero, North Riverside, Brookfield, Lagrange Park, Franklin Park, Norridge, Oakbrook, Elmhurst, Bensenville, Lyons, Stickney, Harwood Heights, IL area. Product availability may vary. Contact us for the most current availability on this product. Browse other items in the Baxter collection from Al-Mart Furniture in the Oak Park, River Forest, Chicago, Elmwood Park, Forest Park, River Grove, Maywood, Melrose Park, Berwyn, Cicero, North Riverside, Brookfield, Lagrange Park, Franklin Park, Norridge, Oakbrook, Elmhurst, Bensenville, Lyons, Stickney, Harwood Heights, IL area.